India crosses 800 Million Telecom Subscribers –Adds 19m mobile users in Jan! The Indian Telecom subscriber count has reached 806.13 Million by end of January 2011, thanks to unabated growth in mobile subscribers. India added 18.99 Million new Mobile subscribers in January to take the total mobile subscriber count to 771.18 Million. has declined to 66.79% from 67% where as share of Rural Subscribers has increased from 33% to 33.21%. With this, the overall Tele-density in India reaches 67.67 percent. Interestingly, according to the new VLR data released by TRAI, out of total 771.18 Million mobile subscribers, 548.66 Million were active subscribers. So roughly about 71 percent of all the connections sold are being actively used. It is also interesting to note that Bharti Airtel has maximum active subscribers (92.63%) closely followed by Idea (90.34%). When it comes to region, Mumbai has lowest proportion of active subscribers (59.59%), while Jammu & Kashmir has the maximum (81.26%)! I was also looking forward to see the churn in between telecom providers due to onset of Mobile Number Portability. It seems from the report that instead of actually being beneficial to smaller providers, it is exactly the opposite. They have lost more subscribers to their larger counter-parts than other way around. 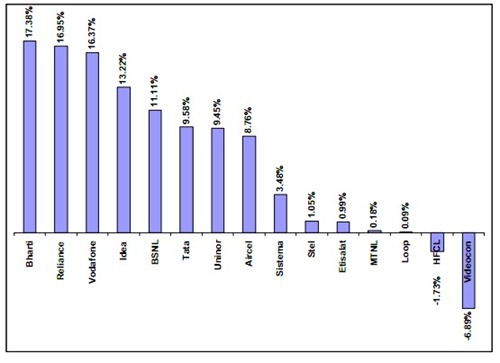 Infact, Videocon and HFCL are actually showing negative growth! Bharti maintained the lead adding 17.38 percent of all subscribers followed by Reliance (16.95) Vodafone (16.37) & Idea (13.22%). None of the newer Operators are able to make the mark with all of them put together adding less than 5% of all subscribers. 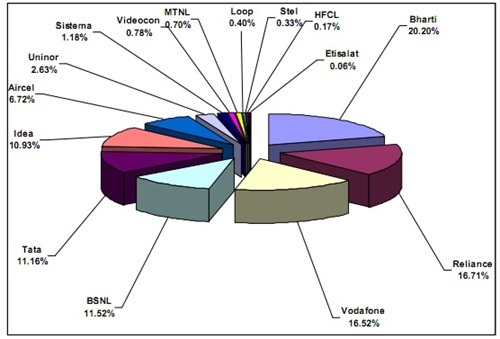 Bharti leads the pack with over one-fifth of Indian Telecom market under its fold, followed by closely placed Reliance (16.71%) and Vodafone (16.52%). Broadband growth remains subdued – In the month of Jan total of 0.29 million broadband subscribers were added taking the total kitty to 11.21 million, thus showing a growth rate of 2.70%. Bloggers beware–Indian Govt moving towards online censorship! A new Laser which could revolutionise data management! Telecom Ombudsman Will Resolve Grievances; BSNL Launches Data Packs For IPL! SIM-Less Calling Allowed As Internet Telephony Gets Approval From Government! TRAI Launches Telecom Tariff Comparison Portal – 4 Things You Need To Know! Connections may be 800 million but I have a suspicion that the total subscribers are not more than 300 million – about the size of the Indian middle class, due multiple phones assigned to each person. I know many that have more than 5 cell phones, to avoid roaming charges. What has been the most interesting point is that while Reliance suffered a net loss of over 3 lac subscribers for Jan due to MNP, it made a net addition of 32 lac subscribers in all for Jan. This essentially means that had MNP been not there, Reliance would have made a net addition of 35 lac subscribers. 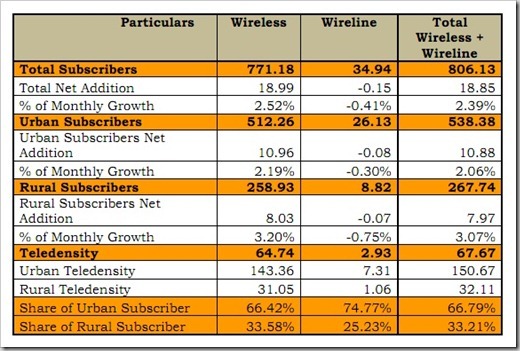 This implies that Reliance was more effective in wooing the new subscribers than any other operator, but it failed miserably to retain its existing subscribers.